Some might call it trash.....but if it brings in the cash! 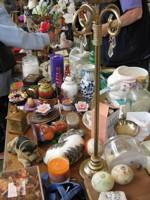 A Trash and Treasure stall is an easy fundraising idea for your fete or event. They are also sometimes called White Elephant stalls - a name derived from an Asian tradition of giving the impressive gift of rare and sacred white elephants to important friends and allies. The cost of whose upkeep was actually more than any benefit to be had from keeping them! It is the same with finding trash and treasure for your stall. Everyone has something at home that they don't really want but that is too good to simply throw out. These items may be old. In some cases very old. Or brand new. It is nice to have a good selection of both. Some people love to pick up a bargain item that's never been used. To others nothing beats the thrill of a good rummage through a mound of bric-a-brac in the hope of unearthing some desirable knick knack. To collect suitable items for your stall send out plenty of requests well in advance of your fundraiser. Many families will be able to find something they have tucked away. Unwanted birthday and Xmas gifts often find their way onto white elephant stalls. Others may be glad to have the chance of a good clear out. Sometimes people have bits and pieces of smaller furniture that will be very suitable. You may like to offer a collection service for larger items. Be vary however of accepting items that really should be going to the tip. You need to store the items somewhere safe and dry until your event. If this can be at the actual venue such as school, church or village hall so much the better. Do sort through the items and make sure that you are not missing anything valuable amongst the donations. Sometimes it may pay to take an item to a specialist store or e-bay it rather than let it go for less than its worth. In particular check through boxes of "costume jewellery" it is not uncommon for the real thing to be found lurking amongst the fake beads, brooches and baubles! On the day of your event arrange your wares attractively. People do like to have a good sort through however so try not to be too precious about your carefully considered display. It will (hopefully!) be swept away by the frenzied hordes of bargain hunters! Some people like to price all the items on their stall. Others see half the fun in making it up as you go along and haggling over a bargain. You could also adopt a sticker system- all items with a red sticker are one simple price etc. If you sell any larger items offer to put them somewhere for collection later. 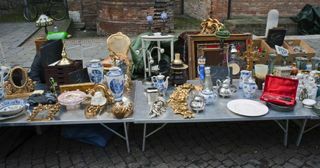 A Trash and Treasure stall offers the chance to be a market trader for the day. It is not the place for Shrinking Violets or Timid Tims. Get the right person in charge of this stall and it will be a lot more fun and make a lot more money! Its not just adults who enjoy a rummage through other people's cast-offs. Second hand toy stalls are magnets for young bargain hunters. Parents too will appreciate second-hand items that other families have outgrown but can be expensive to buy new. Trash and Treasure guarantees to send them home happy. Ok they might not have realised they were desperate for a stuffed owl bookend until you sold it to them but "Hey...Its all in a good cause!"